The novelty has worn off a bit, so Jordan is less enthused about sitting on the potty than she was this weekend. She has still had some major triumphs (like using the potty at the mall!! ), so we’re trying to focus on that rather than the ever-growing piles of soiled laundry. Today the reward for being such a big girl and trying the potty was a trip to the store to pick out some flowers. Her Mimi and Pop would be so proud! Hang in there–Rome wan’t built in a day and little princesses take their own sweet time playing the potty game. Hope the momentum picks up soon. 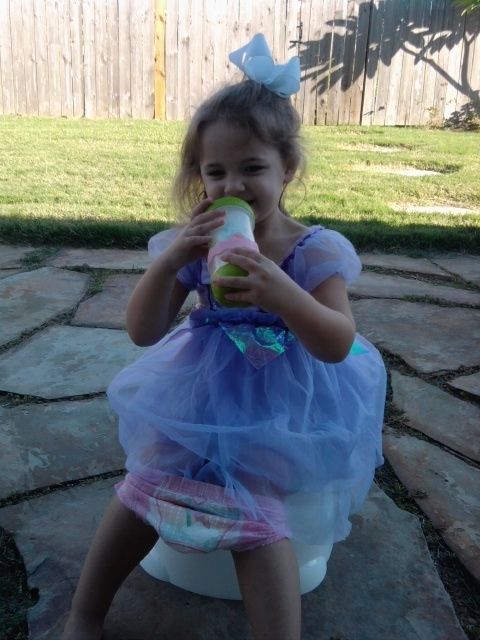 Does she appreciate how cool it is that her mommy lets her take her potty outside!? Come on kid.